Home » Game Reviews » One Minute to Midnight: Can Doomsday be Avoided in11:59? Written by: KristaG on March 27, 2019. Doomsday is fast approaching humanity. 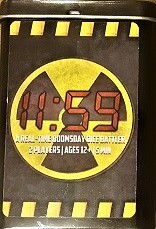 The 1947 metaphorical clock has been set to one minute to midnight in Rampage Games LLC‘s newest 2-player dice game, making it the closest humanity has ever come to man-made global catastrophe. The closest we have ever gotten before now is two minutes to midnight, first in 1953 and again in 2018, where it has remained. Do you have what it takes to reach a diplomatic solution or is our complete destruction imminent? Setting up takes less than 5 minutes! 11:59 is designed by Chris Rossetti and is a micro-game that can be set up and played within 10 minutes or less! The entire game is contained within a small tin, making it compact and portable. Upon opening the tin, each player will receive 2 dice, 2 VIPs (meeples), 2 Bunkers (chevrons), and a Nuclear Missile all of a matching color. The 2 remaining Bunkers are set aside along with the 7 Diplomacy gems. 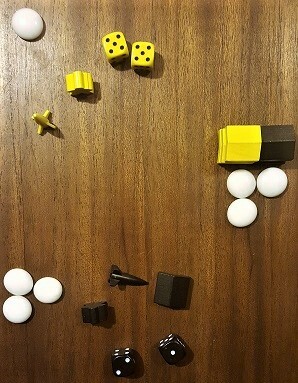 No first player is chosen as both players will be simultaneously rolling their dice throughout the game, but each player’s missile begins in the unloaded position on its side. My Player 2 and I found we both tended to opt for mutual destruction over diplomacy — not sure what that says about the 2 of us!! As all gameplay is simultaneous, there are no turns or rounds. Each player simply rolls their dice over and over again hoping to roll either a set of doubles or a combined sum of 7. Should a player roll doubles, they get to either “load” their nuke, launch their loaded nuke, or employ propaganda. Loading a nuke means standing it upright so it’s ready for a future launch. When launching a nuke, it will remove either a bunker or, if no bunkers remain, a VIP from the game and the nuke will be placed back on its side. If a player chooses to employ propaganda, they force their opponent to lose a Diplomacy gem. 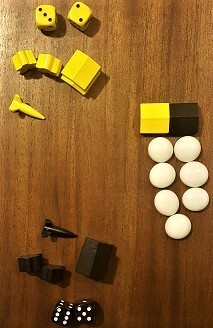 Upon achieving a roll of 7, a player may either earn a Diplomacy gem or spend a Diplomacy gem to build up their Bunker if any Bunker pieces are available in their color. The first player to either earn 5 Diplomacy Gems or completely wipe out their opponent wins the game. This usually takes less than 5 minutes to achieve. However, the game does come with a campaign variant for longer gameplay! Personally, I love micro games so this was something that immediately piqued my interests! The theme and simplicity of the components were bonuses due to their uniqueness. Typically, Doomsday is a topic found only in movies or in literature instead of gaming, so I was curious to see if the theme would be more than skin deep in 11:59. To my surprise, the tension and potential destruction were very real! However, we also found that the included dice tended to slow the game way down! Some of our younger players slipped up on their math while trying to count pips and others made other mistakes due to issues with their eyesight. To correct this, we simply swapped out the pipped dice for numbered dice and it seemed to clear up everyone’s problems. As there is no reading involved in the game, I feel it is one that can be played by all ages as long as they can do simple addition. 11:59 is also a game that can be played without a language barrier issue, which makes it pretty cool. Overall, I really enjoyed the game once we swapped out the dice and I am looking forward to following along with the quickly approaching Kickstarter campaign. However, I feel I should also point out that if you are the type of gamer who feels that player interaction is an extremely important aspect when picking out a new game, 11:59 is probably not going to be for you as your attention will mostly be on your dice and making your own quick decisions instead of the other player. The campaign itself will be launching on April 9th, 2019!